This book continues to be a heck of a lot of fun. The Fantastic... I mean, The Terrifics combines a genius, a woman who's barely there, a stretching marvel and a brutish monster into a team, whether they like it or not. Some mysterious force has linked Mr. 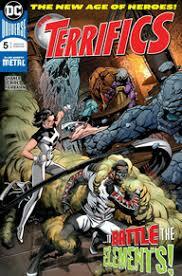 Terrific, Phantom Girl, Plastic Man and Metamorpho, and it forces them to stay and work together. This issue begins with a leisurely "check in" with the characters, what they're doing and how their significant others feel about the fact that they've been gone for a while. Then it launches into a crazy emergency that may (or may not) shed more light on the mysterious origins of Metamorpho. It's loaded with great story and art by Doc Shaner and Jeff Lemire, and it manages a great balance between action, humor and character moments. You really should be reading this comic (if you're not already).